A Neutral Calendar Spread strategy (which is normally referred to as just a Calendar Spread) involves selling an At The Money (ATM) option in the near month (closest to Expiration) and buying the same option at the identical Strike Price but in the following month which has a longer period of time before Expiration (the far month). 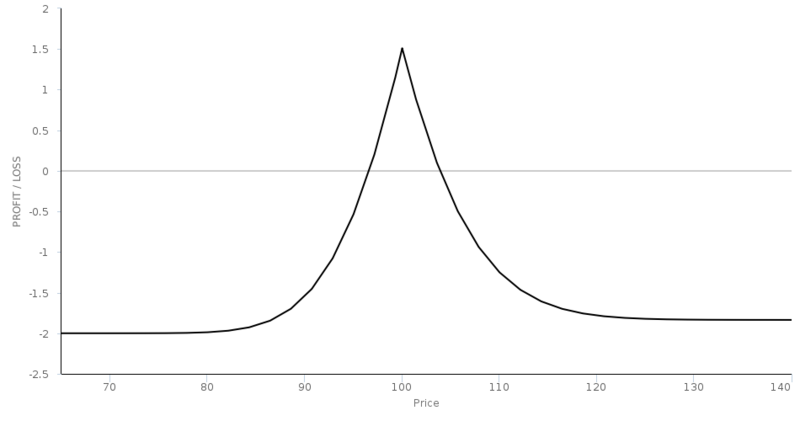 The effect of Theta (time decay) reduces the price of the sold or Short option faster than the Long option to expand the potential profit. Calendar Spreads are sometimes called 'Time Spreads'. Trading an Options Calendar Spread for profit - complete how to. Video on finding and implementing calendar spread trades using stock options from 'Uncle Bob's Money' options advisory service. Riskreversal.com article about Calendar Spreads. Article by Kim Klaiman of Steady Options with some advice and recommendations for trading calendar spreads. This article discusses the conflict between Calendar spreads being volatility-positive (long vega) but still needing to remain within a trading range, as with short volatility strategies like Iron Condors. Tasty Trade article about Calendar Spreads. Background and overview about how to trade calendar spreads. OIC description of Calendar Spreads using Calls. The Options Guide article on Bull Calendar Spreads.